Andrew Gulli, editor of The Strand magazine, discovered an unpublished F. Scott Fitzgerald story in the Princeton University archives. Gulli released the story in the summer issue of The Strand, seventy-five years after the author’s death in 1940. The story, entitled “Temperature” is a comedic tale about a 31-year-old writer named Emmet Monsen, who is a heavy drinker and suffers from heart disease. Gulli believes the story was never published because it was written in 1939, just a year before Fitzgerald died, when the author had a falling out with his literary agent. 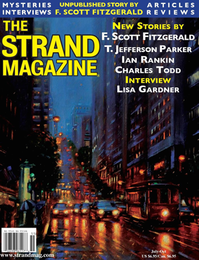 Interested readers can check out the current issue of The Strand to read the Fitzgerald story alongside work by Ian Rankin and T. Jefferson Parker. Andrew Gulli, editor of The Strand magazine, discovered an unpublished F. Scott Fitzgerald story in the Princeton University archives. Gulli released the story in the summer issue of The Strand, seventy-five years after the author's death in 1940. The story, entitled "Temperature" is a comedic tale about a 31-year-old writer named Emmet Monsen, who is a heavy drinker and suffers from heart disease. "There's some madcap comedy, some Wodehousian dialogue, some romance, even a little bit of some tragedy in it," said Gulli about the story in an interview with NPR. "I just was struck by how funny, how interesting it was. And I said to myself, 'I really have to have this story.'"